The Master Degree in Electrical Engineering has as its main objective the education of high-profile professional figures able to cope with all issues relating to the production, distribution and efficient use of electrical energy. Particular attention is devoted to the broadening of primary energy sources, the energy conversion and the control of electrical systems. - to be able to work as a team in order to design systems that require a multidisciplinary approach. The course is articulated giving great emphasis to the characterizing topics (Electrotechnics, Electrical Systems, Electric Machines, Electrical Measures). In these courses, the students learn and strengthen the knowledge about the electromagnetic fields and circuits, operation of machines and electrical systems, materials for electrical engineering, planning and operation of electrical energy systems, electronic and laboratory instrumentation, power electronics, industrial automation. In many course lessons, a significant part of the lesson is devoted to practical and laboratory experiences (especially in design-devoted courses), so that the student can consolidate the theoretical knowledge gained through tests and experiments. 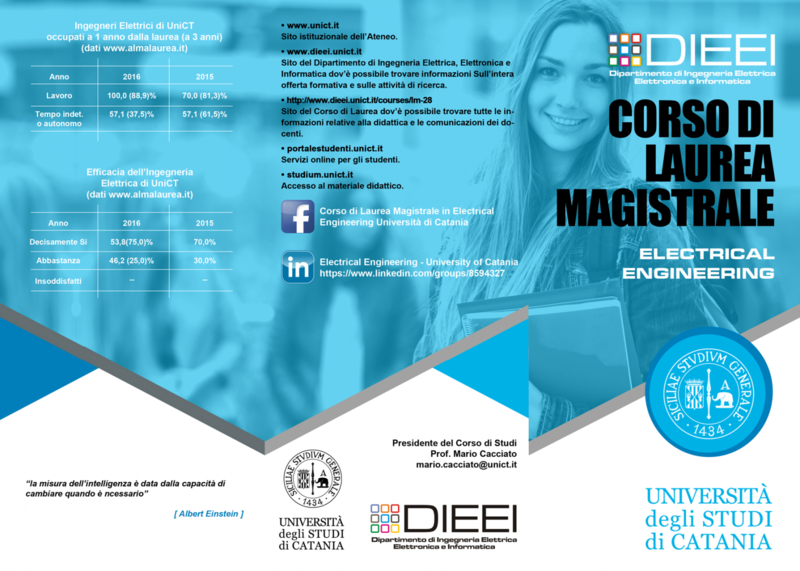 Candidates for the Master Degree in Electrical Engineering will have to test their skills by writing a thesis to be carried out autonomously, following the tutor directives, which may cover topics of a theoretical or applicative nature within the disciplines characterizing the Master.